Mulberry Street is a charming corner combo of family run restaurant and bar. Locals make sure tables in the restaurant are much sought after, so book ahead. The menu changes regularly, but you can expect to be tempted by home made pate, spicy fish cakes, mouth-watering beer battered haddock and chunky potato wedges, and maybe something with local favourites - black pudding and haggis. Or you can step into the bar lounge that takes up the other part of the corner, and sit in the comfy seats for a chat with friends, taking in the laid back, very friendly feel of this homely place. Great news! 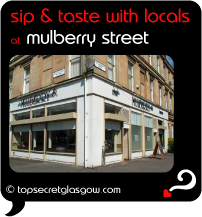 Finding this page means you can now join our VIP list for Mulberry Street. Grab your very own web page all about Mulberry Street. Do you have a special story about Mulberry Street? A funny experience? A grand occasion? A funky photo? A personal tip? A top secret?